The almost eternally sunny skies of Texas make it the ideal location for the integration of a grid-tied solar array system into your custom home from Sustainable Homes, Inc. The PV solar array systems that power our net zero energy and positive energy homes are based on the size of the home, projected household usage and the ability of local utility companies to accommodate grid-tied solar arrays. However, the system’s ability to provide sufficient energy for the household needs relies almost entirely on our ability to reduce the electrical demands to be placed on the system by as much as possible. By first ensuring that the household’s needs for electricity are reduced to the lowest possible levels, a much smaller solar array system is required to achieve net zero energy. This helps us to fulfill another of our primary goals as a company—to build sustainable homes at an increase of only 10 to 12% above the cost of conventionally-built homes. In keeping to this margin, our clients will see a return on their investment within five to seven years (before federal, state, and local rebates). It’s yet another powerful example of the fact that our homes make good sense environmentally as well as financially. Depending on the specific location of your custom home, you may also be able to take advantage of “grid-tied” power, where the home is able to store and withdraw the power it produces with the local utility company. Any extra power that the system generates during the day is banked with the utility to be drawn from when the system is not producing. However, be aware that different utility companies have different net-metering programs. Some buy back the power at wholesale price, but resell it back to the consumer at retail. 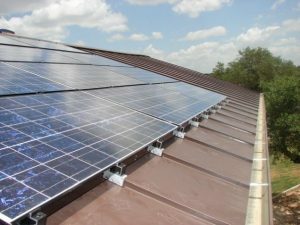 Some utility companies, such as The City of Austin and CPS in San Antonio, even offer sizable rebates for customers who install a PV system. The bottom line is that it’s very important to familiarize yourself with the specifics of your local utility company’s program. Energy-efficient PV solar array systems are integral to the ability of our homes to successfully achieve net zero or positive energy. We can help you navigate through your local utility provider’s policies in order to ensure that the solar system installed on your new custom home from Sustainable Homes, Inc. will be capable of providing you with maximum savings while having minimal environmental impact for decades to come. Find out more about the remarkable solar technologies we employ in all of our energy efficient, net zero energy and positive energy homes. Just give us a call at 830-537-5290, or contact us using the button below. We’d be happy to explain the system in more detail, and to schedule a time to provide you with a free consultation and quote, in order to help you decide whether a sustainable custom home would be the perfect choice for you and your family.